I found a whole variety of sounds that got my attention. They end up being called R&B, straight ahead, jazz, whatever. I just love the music. 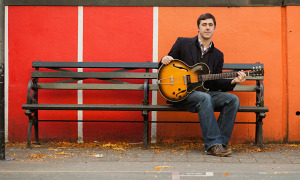 "I recently did it on a gig and one of the patrons told me, in her words, she was 'messed up.' It affected her. I gave a little intro into where the song is coming from. The band got into it. I finished the tune. Went through a whole bunch of other songs. When I got off the stage, she grabbed my hand and said, 'Onaje, I just want you to know I'm kind of messed up by that song.' It took her through a roller coaster of emotions. I was sorry she was messed up, but happy that I made my point. 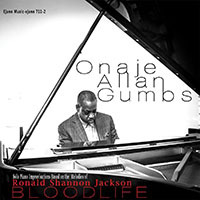 The words are that of pianist, composer, arranger Onaje Allan Gumbs and the song is "Lament, a poignant ballad found on his latest recording, Sack Full of Dreams, released early this year. It was written years ago as a tribute to those who died in the infamous Attica State Prison riot. Its haunting voice and subject matter is what affected the young woman so much at that nightclub. It's brought to life on the CD by the slow, luscious tenor sax of Mark Shim and the intricate voicings and delicate runs by Gumbs on piano. 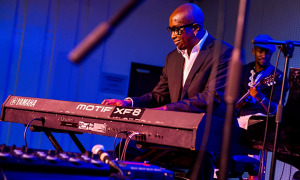 Gumbs has been successful in a wide array of musical styles for more than thirty years, from arranging and performing pop and R&B tunes for Phyllis Hyman, Norman Connors and Noel Pointer, to blowing on top- notch straight-ahead stuff with Woody Shaw and Betty Carter, among others. And things in between. 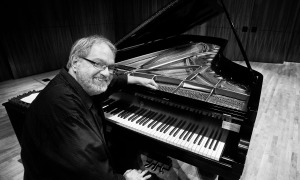 But it is songs like "Lament and the title cut to the new CD that exemplify a big part of what is behind the work of the masterful, if relatively unsung, musician. Dare to Dream (MCA, 1991), an early Gumbs album, and Remember Their Innocence, a 2005 Ejano release dedicated to the children of the globe caught in an uncertain world, portray in their wording that they speak about things beyond music. "Owner of the feeling is one of the Nigerian translations of "Onaje. It suits his music, no matter what genre, and his warm spirit. In 1986, Onaje received the Min-On Art Award from the Min-On Culture Center in Tokyo, "in recognition of his great contribution to the promotion and development of a new musical movement for people with the aim of the creation of peace. Other musician recipients include Herbie Hancock, Wayne Shorter and Buster Williams. 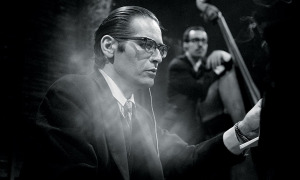 He says it was his mother who impressed upon him that music isn't just notes, but important to the human spirit and therein lies its importance. So whether it's a hit like "Betcha By Golly Wow, that he arranged for Phyllis Hyman, or the arrangement of "Stella By Starlight" he did for the New York Jazz Repertory Company in 1974 as part of a concert honoring Miles Davis at Carnegie Hall, or "Lady in My Life, with Stanley Jordan, that helped propel the album to the top of the Billboard charts, it's all done by Gumbs with feelingand professionalism. There are a great deal of other elements and parts to Onaje, as his work has shown over the years. 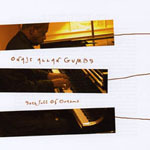 In 2003, he did a live club recording, Return to Form (Half Note), at the Blue Note, and with his latest offering, Gumbs returns to the old-fashioned way of studio recording. Sack Full of Dreams was cut, save for a vocal overdub, in two days. "I wanted to make sure the setup was such that I was in close proximity to the band, still allowing for the separation so there was no real leakage. I really wanted to have a live feel, says Gumbs. "So that's what we went in there with. Usually a studio session will go a few days. Sometimes a couple weeks. It contains songs penned by Herbie Hancock, Freddie Hubbard and even the three guys that wrote "The Fishing Song (yup, your ears are hearing right ... it's the Andy Griffith theme song. But very hip here). The title cut is a song of hope that Gumbs hopes will resonate. He's known the tune, and its author Gary McFarland, for many years. "I always thought it was an incredible piece of music with almost the same kind of urgency that you hear in 'What's Going On,' or 'Someday We'll All Be Free,' says Gumbs. "A lot of my titles have dealt with that kind of observance of what's happening around us. I had an album, Dare to Dream, which was a song of motivation. Previous to this album I had a project called Remember Their Innocence, which is dedicated to children. I wanted to somehow be a part of a healing process. I felt that this song, at this time, was very pertinent and very much needed. I felt I really wanted to revisit that song because it means a lot to me. Gumbs got his friend, singer Obba Babatunde, to sing the song. Ironically, Babatunde had been looking for the song. "I sent him the lyrics, thinking he might not know the song, and asked if he would do it, Gumbs recalls. "He ended up e-mailing me back. He said, 'Onaje, I'm having tears in my eyes because I've been looking for the song. I've been wanting to do this song for a long time, and no one seemed to know where I could find it. If you want me to do it, the answer is: yes.' That's how it started.